Independence was home to Pulitzer Prize winning playwright William Inge, who, in his novels My Son is a Splendid Driver and Good Luck, Miss Wyckoff, remaned it Freedom. Nearby the city, a small cabin and monument to Laura Ingalls Wilder note that the Ingalls family settled in the area until forced to move because they were squatting on Native American land. Little House on the Prairie is well-loved by children and adults all over the world. With a current population of around 10,000, Independence, county seat of Montgomery County, is home to the William Inge Center. A William Inge Festival has been held annually at Independence Community College since 1981. Inge made Independence's Neewollah Festival part of his work. First held in 1919, Neewollah is the oldest annual celebration in Kansas. 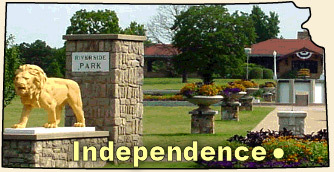 Independence has also been home to Alf Landon, the 26th Governor of Kansas, Harry Sinclair, founder of Sinclair Oil, and television journalist Bill Curtis. Contact webmaster@washburn.edu with questions or comments.